The industrial PDA »Elf« from Datalogic impresses not only with its absolutely robust construction and perfect ergonomics, but also with its enormous power and never before seen functionality in a handy format. 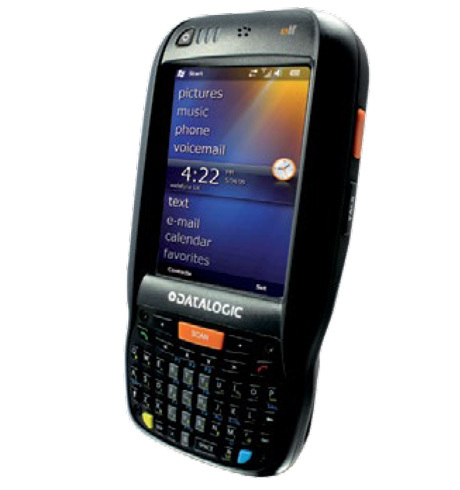 Whether indoors or outdoors – the device can be operated one-handed using the touch screen (640×480 pixels) or keyboard (27 numeric or 46 QWERTY keys). The powerful memory and performance guarantee high quality data processing: the fast 624 MHz XScale processor, 256 MB RAM/Flash and the integrated Micro SD slot ensure reliable speed and security. The PDA, according to the version, scans all common barcodes either via 1D laser scanner or 2D imager, while the integrated 3 megapixel camera reads images and signatures. The integrated flash provides optimal lighting, even in difficult lighting conditions. The Elf is equipped with Datalogic’s patented Green Spot scan confirmation, as well as vibration and LED. The user receives a direct confirmation on the barcode after each successful scan and can be sure that the barcode was recognized. This reduces work time while increasing productivity. Use the pre-licensed PAL software to easily tailor the data collection to your needs. A selection of various wireless technologies are available for secure data transmission: Bluetooth 2.0 EDR, 802.11 a/b/g with Cisco CCX V4 certification and UMTS HSDPA for mobile voice and data communication. Additionally a powerful A-GPS for navigation and positioning is available standard in the compact PDA, providing sophisticated features for every application. The housing of the Datalogic Elf is robust enough to withstand falls time and again from heights up to 1.5 m. Additionally, it is IP64-certified and protects against dust, splash water and other foreign objects. Within the temperature range of -10° and +50° C the Elf performs flawlessly. All users who spend most of their time working outside and on the go will treasure this feature. This applies to both service and courier workers, fleet and warehouse management, as well as in other sectors. A healthcare version of the Elf PDA is also available, providing the same excellent performance of the Elf PDA with a special cleanable plastic case that resists all major cleaning agents.